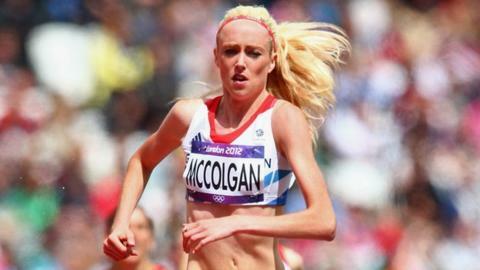 Scottish athlete Eilish McColgan is ruing the end of the season after her fourth personal best of the year. McColgan, daughter of Olympic silver medallist Liz, sliced 17 seconds off her previous 3000m steeplechase best in Manchester. The 21-year-old capped her season with a debut Olympics appearance, where she came ninth in heat three. "It was great to post such a big personal best and a good way to end my track season," she said. "I've managed now to get into another 3000m race in Italy this weekend at the IAAF meeting at Rieti and that will be it for the track and I will take a bit of a break. "In fact, I wish it was not finishing at all because I still feel there is so much more to come and could improve my 3000m steeplechase time by a good bit. "But the bottom line is, looking back over the season, I've set PBs at 5000m, 3000m, 1500m and the 3000m steeplechase and, of course, been to the Olympics for the first time. "I have to be pretty pleased with that because at the start of it I was just coming back from the broken foot injury I suffered last August," she added.